There are various techniques and methods of adjusting' your spine which are safe and effective. Different techniques are appropriate for different people at different times. Each chiropractic adjusting technique used at Gateway Chiropractic Center is approved for use in Wisconsin, and both Dr. Laura and Dr. Craig have extensive training and experience in these techniques. Using therapies such as electric muscle stimulation, ultrasound, ice, and heat, we are able to help you manage pain symptoms from injuries or aggravations. Often these painless therapies are used in conjunction with adjusting techniques and other treatments. If necessary, this may be utilized to further assess your health condition.Whether you have had an injury or not, x-ray analysis may be necessary to help determine the location of specific problems. Complex measurements of the spine are often taken in order to determine which chiropractic adjusting technique may be appropriate. Today's high-tech equipment and ultra-sensitive films help minimize your exposure. 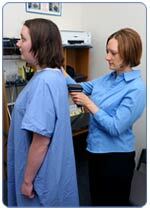 Incorporated into any initial examination or subsequent evaluations, is a Surface Electromyography (SEMG) and a thermography spinal evaluation. We utilize the most current computerized technology that chiropractic care can offer to examine the spine and identify spinal problems. The testing is painless and relatively quick! During post-examination visits, written reports of findings include picture reports of the computer examination results. Dr. Laura and Dr. Craig often recommend massage therapy in addition to chiropractic care. Massage services are available at Gateway Chiropractic Center. There are many wonderful therapeutic benefits possible through massage, and we are excited that we can offer a variety of techniques including Swedish massage and deep tissue massage. Massages are available for 30 or 60 minute periods, and gift certificates can also be purchased at the office for friends, family, or co-workers. An important aspect of healthy living involves the use of nutritional supplementation. Whether for acute pain conditions such as headaches and spinal injuries or for chronic illnesses, using the correct supplements can help your body heal and function better. 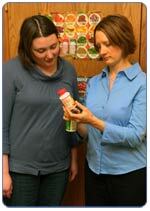 Both Dr. Laura and Dr. Craig incorporate nutritional recommendations into their patients' treatment plans.